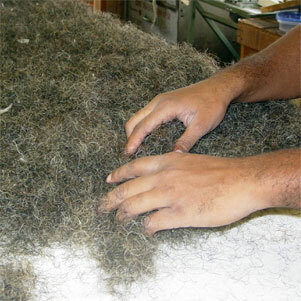 Charles H. Beckley Inc. has specialized in making custom horse hair mattresses for over 80 years and we pride ourselves on the level of quality, comfort, support, and longevity that we offer with all of our products. Our mattresses are proven to last you a minumum of 10 years, and even up to 25-30 years when properly cared for. We make one of the last remaining ‘flippable’ mattresses available on today’s market, which allows for the most important part of caring for your mattress; we recommend flipping every 3-4 months. Flipping your mattress gives you a fresh sleep surface, similar to fluffing your pillow in the middle of the night. Most importantly, it helps the filling materials stay evenly distributed and wear properly to add longevity to your mattress. The “Bristol” is by far our top selling and most popular mattress model. 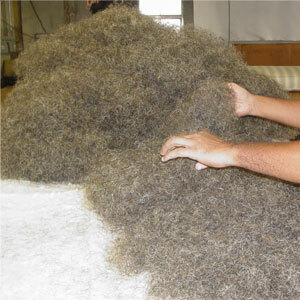 It follows our ideal and original design for mattresses, the mixture of 70% natural hair and 30% cotton felt fillings. It could be said that this is the mattress which has kept us in business for over 80 years. A bit bouncier to the touch on the surface, the “Ashton” is great for children’s beds as well as anyone who is looking for an alternative to the hair. The filling ratio consists of 85% cotton felt and 15% dacron. Consisting of the same filling ratio as the “Bristol”, the “York” instead uses a polyester curled hair to replace the natural hair. We recommend this model for anyone who has heavy allergies as the polyester hair emulates the feel of the natural hair while eliminating any possible allergens. Our 100% Organic Lambs Wool is a great alternative to our other natural fillings as it offers a softer and more luxurious feel than the hair. An important fact about lambs wool, common bed bugs can not live inside lambs wool, therefore this is a great option for many New York City residences. Available in many firmnesses and variations, our Talalay latex can be cut to any width, length, or height; not to mention angles and other extremely custom shapes. We use latex regularly for mattresses made to fit boat cabin beds. With proper templates, we can outfit an entire yacht or boat of any size. Latex is also available in a 100% natural variation. A less expensive alternative to Latex, our foam cores can also be chosen in many variations and cut to any size. We use foam cores for many low profile window seat and bench cushions as well as some of our upholstered daybed mattresses; and of course upon specific request. of the mattress, which offers your body the support it needs for a good night’s sleep. Before any of the curled hair we fill our mattresses with can be used, it has to be seperated and fluffed with our fiber combing(picking) machine. 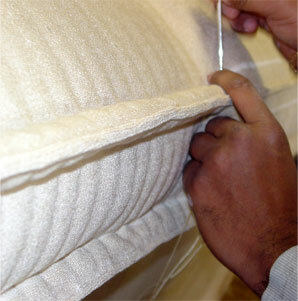 The first step in hand-filling a mattress is to evenly distrubute a layer of hair onto the bottom panel of the cover. This can and will serve as both the top and bottom layer as our mattresses are designed to be flipped regularly. 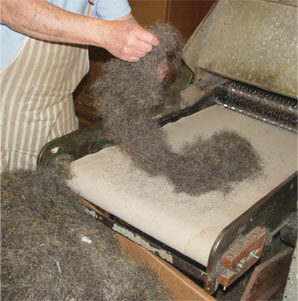 On top of the hair we lay two sheets of all natural cotton felt. This acts as a dampener on the innerspring unit and secures the hair against the cover. After the innerspring unit is laid on top of the bottom half, the top layer is hand-filled. Identical filling ratios are used for the top and bottom of the mattress. 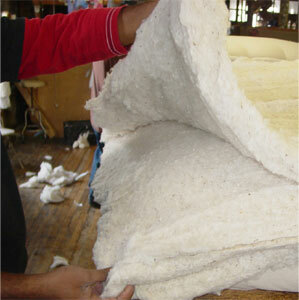 One of the most desired features of our hand made mattresses is the old-fashioned hand-sewn rolled edge. This adds a nice decorative finshing detail to all of our mattresses and also gives the side borders added strength. 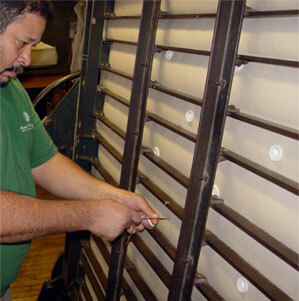 The last step is to tuft the mattress using a large hand wheeled press. Tufting helps maintain the fillings and gives you a uniform thickness across the top and bottom.